The vapor performance for e-liquid was great and the duo will work with any atomizer. One of my favorite features besides the duo option is the ability to change the battery. I think this option will extend the life of the device. 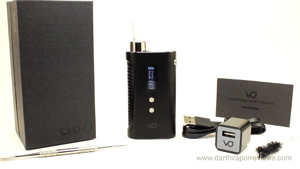 Overall, this is a great vaporizer convenient to any vaping situation. If you would like to pick up the duo for yourself, just click on the link below. * Dual-mode - use with herb,wax,e-liquid. * Fast heat up times with three modes. 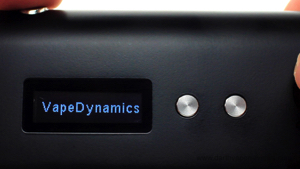 The duo by VapeDynamics is the world's first dual-mode vaporizer giving users the option between dry herb, wax or e-liquid. The box includes: a user manual, warranty card, micro USB charging cable, wall charger, a cleaning brush, dab tool, an extra pyrex glass mouthpiece, an 18650 battery, vaporizer mouthpiece and the duo vaporizer. The duo is made of construction grade stainless steel. 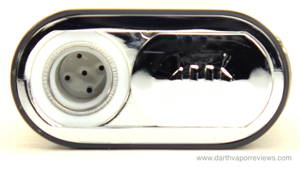 It features a 510 connection for wax and e-liquid and a reinforced ceramic oven for dry herbs. 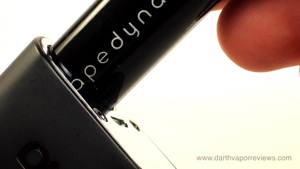 It can be charged via the micro USB port or by replacing the 18650 battery with a fully charged one. Five clicks of the power button turns it on. Clicking three times on the welcome screen brings up the shift options. Choose between right or left hand. To use the duo with dry herbs, slide from the 510 to the ceramic chamber while the device is on. Set the temperature by pressing the + or - buttons. Press the fire and - buttons together to shift between heating speeds. Fast, medium or slow. The temperature range is 300°F - 450°F. Press and hold the fire button for five seconds to start the heating process. When heated, the screen will display "ready" and the blue light will turn on. The oven will shut off after two minutes (120 seconds) and return to "standby" mode. * Short cut off time for oven. 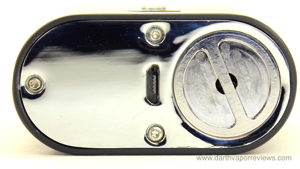 To use the duo with wax or e-liquid, slide from the ceramic chamber to the 510 connection. Press the fire and - buttons together to switch between wattage and temperature control. 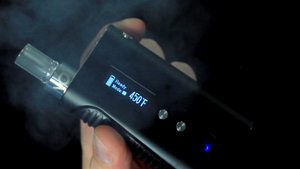 The wattage range is 5-50w and the temperature range is 200°F - 600°F. The duo is one of the coolest devices that I've reviewed. I always thought it would be cool to combine the two and I'm glad someone finally did. 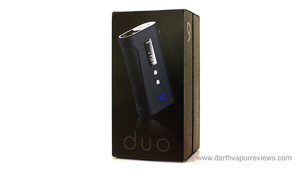 The duo is very well built, sturdy and has a high class feel to it. It is 3.5" in height by 2" in width making it smaller than the Flowermate, a similar slide style vaporizer for dry herb only. 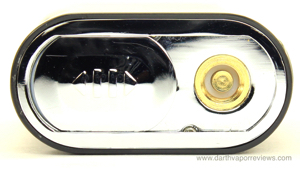 It would be nice to have a compartment for the mouthpiece like the Flowermate has as well as a chamber light. The heating speeds are nice. Fast will give you a quick hit and slow will marinate the flavors.